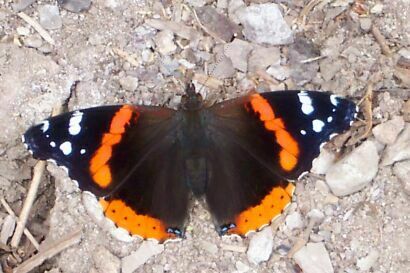 The Red Admiral, Vanessa atalanta, is a common and cosmopolitan Holarctic butterfly of the family Nymphalidae. It inhabits North America from central Canada through the Mexican highlands to Guatemala (Opler, 1992). Typical habitat is rich, moist bottomland woods containing larval host plants such as stinging nettle (Urtica dioica) and false nettle (Boehmeria cylindrica). V. atalanta is typically found in sunlit forest openings or margins (Opler and Krizek, 1984), often in or near stream courses; in moist fields, in city parks, and on ridge tops (Opler, 1992). The dorsal side of the wings is dark brown to black. The forewing has small white apical spots and a prominent red-orange median band, and the hindwing has a red-orange marginal band. V. atalanta's wing span varies from 58 to 76 mm (Opler, 1992); the male forewing length ranges from 2.6 to 3.3 cm (mean = 3.1 cm). Females are slightly larger than males: forewing length ranges from 2.9 to 3.5 cm (mean = 3.2 cm) (Opler and Krizek, 1984). Although V. atalanta shows little morphological variation over its geographic range, it has distinct summer and winter forms. The summer form is larger and brighter, with an interrupted forewing band, whereas the winter form is smaller and duller in color (Opler and Krizek, 1984). V. atalanta is double-brooded throughout most of its range (Opler and Krizek, 1984). It is single-brooded in the northernmost United States and Canada, and triple-brooded in the southern states. In Iowa, V. atalanta is active from mid to late April to late September or early October. V. atalanta is seasonally migratory (Opler and Krizek, 1984; Opler, 1992). It probably cannot survive colder winters in the northern part of its range (Opler, 1992), although Shapiro (1974) reports that adults hibernate successfully as far north as New York. It overwinters in the southern states, including south Texas (Opler, 1992) and Florida (Swanson, 1979; Swanson and Monge-Nájera, 2000). Photo by Kirsten Mortensen, Rochester, New York, taken on the morning of July 9, 2004. The butterfly was sunning itself in a garden where some daisies and echinacea were in bloom. The Painted Lady, Vanessa cardui, is the most widely distributed butterfly in the world (Opler and Krizek, 1984; Scott, 1986). It is found throughout Europe, Asia, Africa, North America, and Central America. It is not a permanent resident in the eastern United States, but quasi-periodically migrates there from the deserts of the southwestern U.S. and northern Mexico (Opler and Krizek, 1984). These migrations are sporadic and often enormous, and often follow rainy periods in these deserts. Scott (1986) recognizes two subspecies: V. cardui cardui is found throughout North America south to Venezuela and throughout the Bahamas and Antilles; throughout Eurasia including India and Ceylon, and Africa including Madagascar. The other, V. c. kershawi, occurs in Australia and New Zealand and strays into Fiji. Hawaiian V. cardui adults are intermediate between the two subspecies, and both forms can develop from the eggs of a single female (Scott, 1986). According to Opler and Krizek (1984), V. cardui prefers open areas, including old fields, vacant lots, and gardens. I have found that in Iowa, V. cardui prefers more open areas such as prairies and fields, whereas V. atalanta prefers forest margins and parklike areas with more trees. Painted Lady larvae feed on a wide variety of host plants of the families Compositae (especially thistles), Boraginaceae, Malvaceae (especially the hollyhock Althaea), common mallow (Malva neglecta), and a number of legumes (Opler and Krizek, 1984) including Iowa soybeans (Scott, 1986) The dorsal side of the wings is orange-patterned. On the underside of the hindwing are five small submarginal eyespots. Females are generally larger than males. Male forewing length ranges from 2.5 to 3.3 cm (mean = 3.0 cm); female forewing length ranges from 3.0 to 3.4 cm (mean = 3.2 cm) (Opler and Krizek, 1984). V. cardui, like V. atalanta, has distinct summer and winter forms. The summer form is larger and brighter and has blue pupils in the submarginal spots on the dorsal hind wing (Opler and Krizek, 1984). The winter form has entirely black wing spots. The number of broods in any one place may vary from year to year because it is not a permanent resident in most of the U.S. (Opler and Krizek, 1984). Photo by Mary Jane "M.J." Hatfield, north of Ames, Story County, Iowa, September 20, 2003. The butterfly is resting on a thistle. 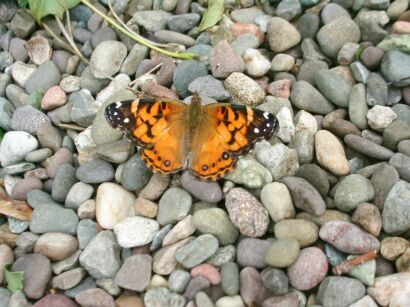 The American Lady, Vanessa virginiensis, inhabits North America from southern Canada through the entire United States, as well as the mountains of Central America, Colombia, and the Galapagos Islands (Opler, 1992). Typical habitat includes open areas with low vegetation, such as meadows, floodplains, vacant lots, and beach dunes (Opler and Krizek, 1984; Opler, 1992). The larvae, unlike those of the Painted Lady, feed on a comparatively limited range of foodplants. The preferred food sources are plants of the everlasting tribe of the Compositae, such as sweet everlasting (Graphalium obtusifolium), pearly everlasting (Anaphalis margaritacea), and plantain-leaved pussytoes (Antennaria plantaginifolia); they also feed occasionally on burdock (Arctium), wormwood (Artemisia), and ironweed (Vernonia) (Opler and Krizek 1984; Scott 1986). The dorsal side of the wings is orange-patterned, and a small white spot in the center of the cubital cell of the forewing is a distinguishing characteristic of this species. 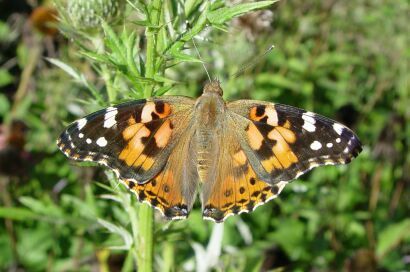 The American Lady can be most readily distinguished from the Painted Lady by the two large, black-ringed blue eyespots on the underside of the hindwing (Painted Ladies instead have five small submarginal eyespots). V. virginiensis' wing span varies from 53 to 67 mm (Opler, 1992); the male forewing length ranges from 2.4 to 3.0 cm (mean = 2.7 cm). Females are very slightly larger than males: forewing length ranges from 2.4 to 3.1 cm (mean = 2.8 cm) (Opler and Krizek 1984). As do V. atalanta and V. cardui, V. virginiensis has distinct summer and winter forms. The summer form is larger and more brightly colored, whereas the winter form is smaller and paler, with reduced black markings (Opler and Krizek 1984). The number of broods varies from two in the northern part of its range to three or four in the southern U.S. Adults occur in every month in Mississippi and Florida, but it is uncertain whether or not they are reproductive there during the winter (Opler and Krizek 1984). Scott (1986) describes V. virginiensis as being "somewhat migratory." A northward migration was observed in Iowa and southern Ontario in spring 2001. Whether or not adults can survive cold winters is not clearly documented (Opler 1992). Because V. virginiensis may not be able to overwinter in the northernmost states (Opler and Krizek 1984), migrants may need to recolonize much of the eastern U.S. each year (Opler 1992). Photo by Jim Tompkins, Halifax, Nova Scotia, taken about noon on October 1, 2003, 36 hours after the eye of Hurricane Juan passed over Halifax. The butterfly rested on the ground for about 5 minutes before flying away. The West Coast Lady, Vanessa annabella, unlike the previous three species, is limited to western North America. It most commonly occurs in a region between the West Coast and a north-south line through eastern Colorado. It typically inhabits open areas, and occurs at various levels in the mountains, from the Upper Sonoran to the Canadian zones (Scott 1986). The larvae prefer to feed on plants of the families Malvaceae (including hollyhock) and Urticaceae, including the nettle species Urtica dioica and U. urens) (Scott 1986). The dorsal side of the wings somewhat resembles that of the Painted Lady, with two distinguishing differences. 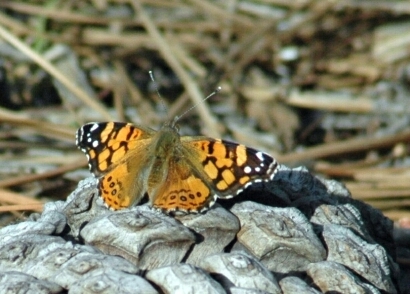 The postmedian bar on the forewing of V. annabella is orange, rather than white as for V. cardui, and the tip of the forewing is more angled than that of the Painted Lady. Photo by Ron Hemberger, Irvine, California, taken at the University of California - Irvine Arboretum on January 17, 2006, 2:20 p. m. Pacific time. The butterfly is resting on a very large pine cone. Image copyright 2006, Ron Hemberger. Link to the original photo in BugGuide. Opler, P.A. (1992). A Field Guide to Eastern Butterflies. Houghton Mifflin, Boston. Opler, P.A. and G.O. Krizek (1984). Butterflies East of the Great Plains. Johns Hopkins University Press, Baltimore. Scott, J.A. (1986). The Butterflies of North America. Stanford University Press, Stanford, California. Shapiro, A.M. (1974). Butterflies and skippers of New York State. Search 4: 1-60. Swanson, H.F. (1979). Butterfly Revelations. Rollins Press, Inc., Orlando, Florida. Swanson, H.F. and J. Monge-Nájera (2000). The effects of methodological limitations in the study of butterfly behavior and demography: a daily study of Vanessa atalanta (Lepidoptera: Nymphalidae) for 22 years. Revista de Biología Tropical 48 (2/3): 605-614. This page was created on September 24, 1999 and was most recently revised on March 31, 2008.